As the popular coworking startup turns to housing, design could be key to making the model sustainable. In January, Fast Company broke the news that the coworking startup WeWork was beta testing its first “coliving” spaces in New York. Today, the company is opening the space–a residential extension of its community-centered office spaces–to the public for rent. The inaugural WeLive spaces are located at 110 Wall Street, in a former office building in the heart of New York’s financial district. WeWork opened office spaces on four of the building’s floors in July 2015, with plans to convert the remaining 20 floors into 600 fully furnished WeLive apartment units (there’s also a lobby and a basement that will be converted into a game/ event room). Divided into “neighborhoods”–blocks of floors that share communal spaces like fully equipped kitchens, multi-use common areas and even stock-it-yourself whisky bars–the WeLive spaces are designed to not only lessen the burden of city living with flexible, amenity-laded housing, but also to encourage a sense of community between residents. WeWork hopes to have the entire building open within the next year, but for now it’s launching a few sections at a time. There are 200 units available–ranging from $1,375 per person in shared apartments to $2,000 for an individual studio–all with the option of either a month-by-month or yearly lease (a $125 monthly fee covers amenities). The apartments are about 450 square feet on average, with the largest units topping out at 1,000 square feet (one-bedroom apartments in the area, by comparison, range in prices from about $2,850 for 451 square feet to $3,500 for 700 square feet). Each apartment comes fully furnished, minimally decorated, and set up with cable and Internet at move-in. As a result, apartments are designed for versatility and include plenty of storage space. In some apartments, for example, a bench from the London-based retailer Very Good & Proper can be used as a media console or as a bench the front hallway. A coffee table WeWork custom-built with West Elm has an extendable piece on top that can rise to the height of a kitchen table. And all studio apartments have Murphy beds from Resource Furniture that lower over the coffee table so no rearranging is necessary. If the decor expands on WeWork’s well-established aesthetic, the design of the building also tries to mimic the social component of its popular office spaces. WeWork has enjoyed success selling hip, community-driven office environments where members also get access to social amenities like kitchens where beer is always on tap. Launched in 2010, the company is valued at $16 billion with more than 50,000 members at 69 locations worldwide. For WeLive, McKelvey wanted to translate that communal approach to housing, but found that it was trickier to incorporate into people’s homes. To give the space a degree of sociability without making it feel forced, McKelvey says, they had to design an environment where residents didn’t have to make such a rigid choice between engaging in social activities or sitting them out. Instead, the social component needed to be more organic. “We thought a lot how you break down that ‘in or out’ situation,” says McKelvey. On each floor, for example, the designers put a sitting area immediately in front of the elevator, to give residents the opportunity run into neighbors and friends, or meet new ones. The floors are laid out in such a way that there is always a common area–a media room that’s also used for community yoga classes, for example, or a laundry room decked out with a pool table–just to the right. That way, McKelvey says, residents walk by open or glass-doored community rooms and shared kitchen on the way to their apartments. The idea is to give people the chance to participate in the building’s offerings like Sunday-night suppers, game nights, or fitness classes, without asking them to take a social risk. Fostering relationships between residents could be key to WeLive’s success. People tend to be happier and healthier when they interact with their neighbors, something that isn’t as simple as it sounds in massive apartment complexes where there’s less a feeling of community. 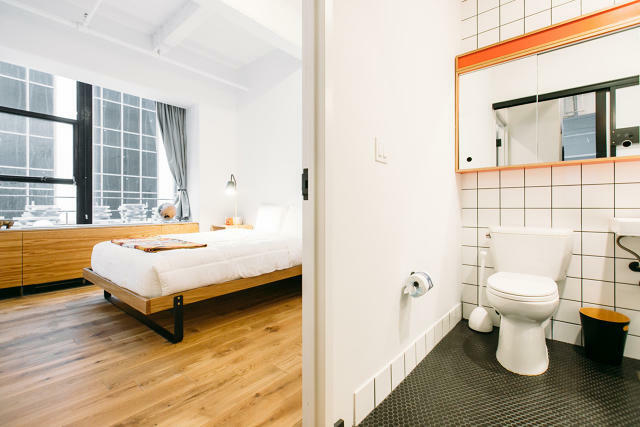 The challenge for WeLive (and the other coliving spaces before it) is potential turn-over, and whether the business can sustain itself if residents decide to stay for only six months to a year before finding a place that they feel is fully their own. In addition to building out the remaining apartment floors–the next batch of which will likely open in June or July–McKelvey and his team are designing the game room and community events space in the basement. WeLive is also starting to beta testing a residential building in Crystal City, just outside of Washington, D.C. Correction: An earlier version of this story noted that the apartments start at $1,400/month per person for a shared apartment and $2,500/month for a studio. An updated price list from WeWork notes that the prices actually start at $1,375/month per person for a shared apartment and $2,000/month for a studio. The article has been updated.